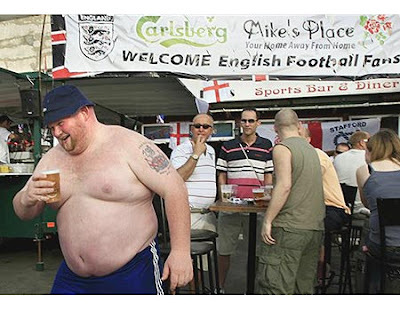 I'd now like to present an explanation of why not all English spectators are ugly violent hooligans. The last few years has been a terribly sad time for small-'c' conservatives looking for sensible reading material. Quadrant has become the official rag for the Queen Isabella Appreciation Society. Policy is almost like Valium in glossy paper form. The Opinion page of The Australian becomes nuttier and nuttier with almost each passing day, a broadsheet version of Fox News. Conservative blogs spend more time commenting on people's physique than on real issues. Were it not for the IPA Review, sensible conservatives would have no option but to keep investing $18 each week on the Fin Review and/or move to the UK and buy the Spectator without paing extra for postage. So much of what passes for conservative commentary has become bigotted monocultural nonsense that makes more sense when you take it into the toilet and wipe it on your backside a few times with the remains of your number 2. Haven't these chaps realised that John Howard lost both the last federal election and his own seat for a reason? And don't they understand why having Dr Brendan "I've never voted Liberal in my life! (that is, until I first ran as Liberal candidate for Bradfield)" Nelson as Opposition Leader was a disaster precisely because he was too busy trying to out-Howard Mr Howard? Now sensible small-'c' conservatives have a chance of making its mark. We no longer need feel embarrassed by monocultural morons busy re-writing sectarian conspiracy theories whilst defending their own links to religious fringe-dwellers (like the Exclusive Brethren, Catch The Fire Ministries, the Lebanese al-Ahbash cult or a certain Saudi fundraiser from Auburn) that make ordinary believers cringe. We need not be ashamed to see far-Right pseudo-conservatives defending the most indefensible abuses of human rights such as locking up children for years in concentra ... woops ... detention centres in the desert until they become severely depressed near-mutes. Let's hope that the ascendancy of Malcolm Turnbull will enable small-l liberals and small-c conservatives to reclaim the centre of the Australian political spectrum. And let's hope that the entry of an Australia/NZ edition of the often-magnificent Spectator magazine will be the beginning of this process. Anway, now that I've gotten that long intro out of the way, let me congratulate the Spectator for extending its arm to a couple of waward colonies. Admittedly, the mag is a little eccentric at times. It also has little hesitation in bagging conservatives when it thinks they are losing the plot. And it does engage some writers who have well and truly lost the plot. But it is always an entertaining and interesting read. Heck, if I was convinced Tim Blair knew how to read and/or write, I'd even recommend he'd subscribe.